When inspiration (to create an identity for himself) struck, Van Gogh decided that sunflowers would be the perfect subject. The result was a series of masterpieces, of which this painting is a part. All of our artists are highly trained to recreate Van Gogh’s work with utmost accuracy. They have studied a number of his techniques, such as impasto, colour mixing, rhythm of application, ambience of the surroundings, and many more. Before Van Gogh decided on creating a series of sunflower paintings, he wanted something that would create an identity for himself as an artist, like Jeannin did with peony flowers, and Ernest Quost did with hollyhocks. In this search, he found that sunflowers were an apt subject. With this idea in mind, Van Gogh went on to create four paintings in Paris and another eleven paintings in Arles. 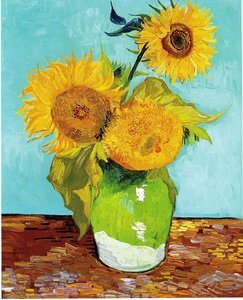 Today, we recognise the sunflowers to be the most famous of all of Van Gogh’s work. 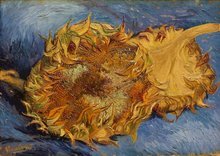 This painting was one of the first sunflowers that Van Gogh drew during his stay at Arles. This was also the time he started drawing sunflowers in vases, instead of having them lie on the ground. Van Gogh specialised in colour since he didn’t want his paintings to be restricted to shapes alone. He decided to let the colours flow, and let them do the talking. The application of impressionism — as well as the Japanese style that deeply influenced him — left him with a style that was unique to himself. Elevate your interior décor with a Van Gogh reproduction or give the art lover in your life a very special surprise today. Buying this exquisite painting will definitely beautify the look of your home as it has the power to capture someone’s mind with its power and beauty. We are sure you will love your reproduced Van Gogh work, but if there is anything less than 100% satisfaction, we offer a full money back guarantee.